Surgical artwork narrating this minimally invasive surgical technique. 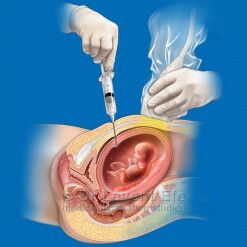 Special emphasis is given to the Ovarian tumor, and the operative technique. 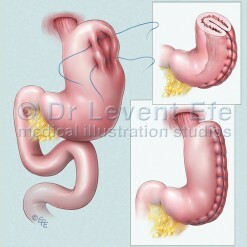 The image is suitable for educating patients about the procedure. SKU: OG11. Category: Obstetrics and Gynaecology (O-G). 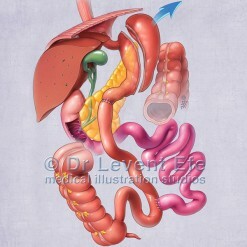 Tags: fallopianTube, laparoscopic, LaparoscopicOvaryRemoval, OvaranTumor, ovarian, OvarianCancer, OvarianCyst, ovAry, uterineTube, uterus. 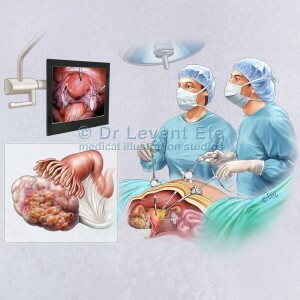 Anatomical illustration depicting the Laparoscopic technique in removal of the ovary (Oophorectomy). The camera and several surgical i nstruments require small incisions, and the surgeon can thoroughly inspect inside the abdomen.